Dortmund - Mario Götze's departure to arch rivals FC Bayern München must feel like a distant memory to Borussia Dortmund. Top of the class and enjoying their best-ever start to a Bundesliga campaign, the Yellow-Blacks have a new hero in town by the name of . The Gabon international has hit the ground running at his new club, with five goals in as many Bundesliga outings taking him to the top of the scorers' chart alongside VfB Stuttgart's Vedad Ibisevic and 1. FSV Mainz 05 winger Nicolai Müller. Seeing how only Paris Saint-Germain FC striker Zlatan Ibrahimovic outscored Aubameyang in France last season, perhaps we should not be all that surprised. The affable livewire's seamless transition to the German game also serves as quite the example to any wannabe Bundesliga stars of the future, but he's not the only one. Fellow summer recruit has likewise taken to the Bundesliga like a duck to water, notching three goals and one assist in four appearances. Safe to say, Aubameyang and Mkhitaryan are anything but your average replacements. BVB's new favourites could be seen working in perfect harmony last weekend as Dortmund made it five wins from five in a 6-2 drubbing of Hamburger SV. 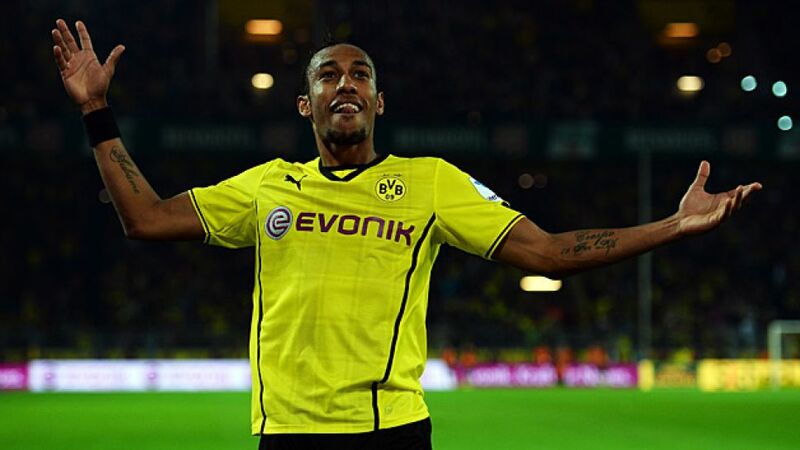 While both men impressed, it was the all-round performance of Aubameyang that really got people talking. The 24-year-old converted two of his five shots on goal and chipped in with as many assists. Not only that, but he also completed 83.3 per cent of his 24 attempted passes, ate up 11 kilometres of turf and made a staggering 51 sprints during the course of the game. To put that into context, that's twelve as many mad dashes and 402.6 metres' more ground covered than attacking team-mate Marco Reus. The challenge now facing Aubameyang is to sustain, if not surpass, the high-octane level of his own performances that has left every single member of the famed Signal Iduna Park faithful wanting more. Few would deny he has the ability and support to do so. He also has the stage, not just in the Bundesliga, but in the DFB Cup and UEFA Champions League too. BVB head coach Jürgen Klopp earmarked the 2015 Champions League final in Berlin as the club's long-term goal following their final defeat to FC Bayern at Wembley last term. With Aubameyang leading the charge, however, a trip to Lisbon next May is anything but out of the question.